The following recipe comes courtesy of Sandra of TheFoodieAffair.com. We highly suggest you follow Sandra's blog and Facebook page. She is an amazing cook and talented photographer! A few weeks ago a representative of Mandarano Balsamic asked if I would like to sample their balsamic glaze and sauce. I was so pleased to try this family recipe! Are you familiar with balsamic glaze? Balsamic glaze is the finishing touch of flavor added to a dish. You may have seen it used at restaurants. A popular use for the sauce is to drizzle it on caprese salads; mozzarella cheese, tomatoes and basil appetizer, but it can be added to so many more dishes! Top it on any type of meat, fruit, vegetable, and even ice cream! 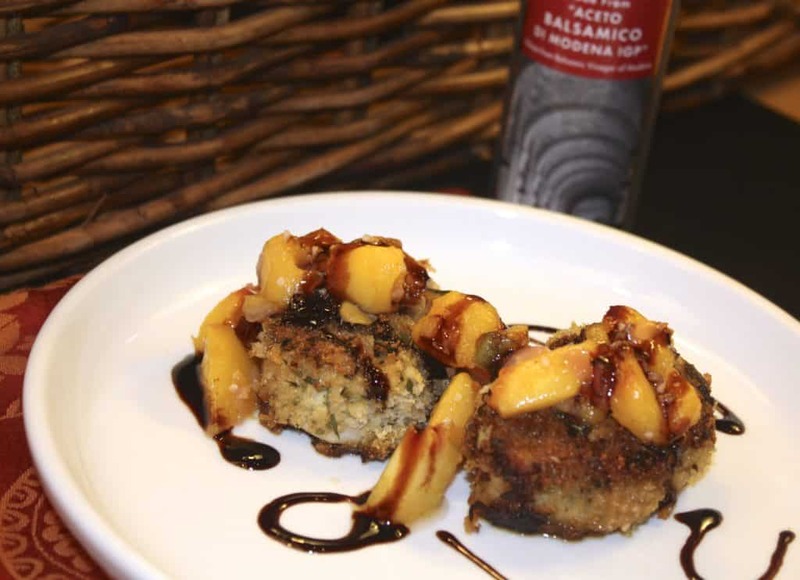 The texture of the crispy coating on the pork combined with the soft peach chutney is a perfect invitation for a balsamic sauce. The medley is simply out of this world! Bottled in Modena, Italy home of some of the world’s best quality aged balsamic vinegar, this thick sauce touches your palate with a rich tang, nicely balanced with sweet undertones. Crispy pork medallions and a moist interior pairs nicely with chutney. 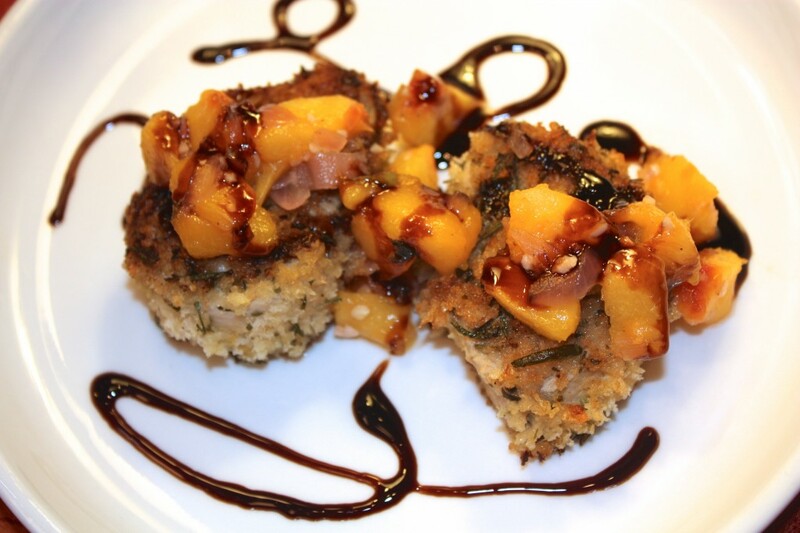 This dish is easy to make and the presentation is beautiful when topped with balsamic sauce. 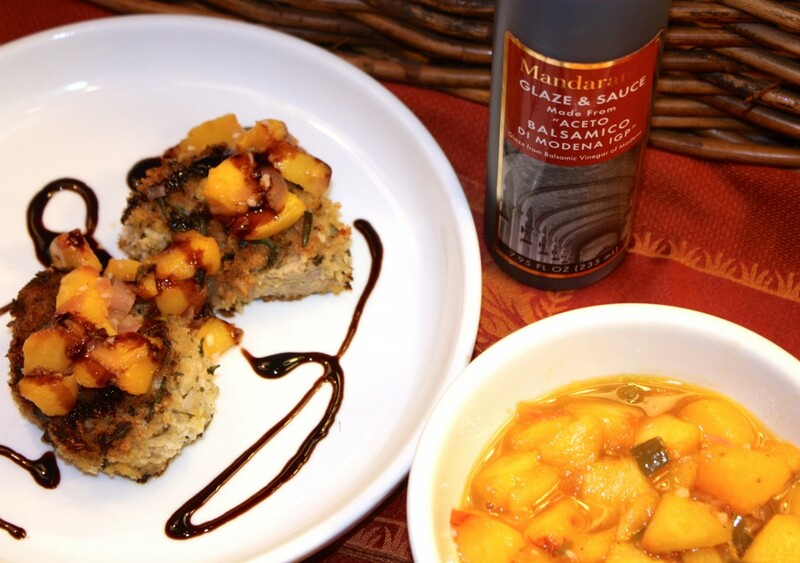 I recommend Mandarano Balsamic Glaze & Sauce. For Pork, preheat oven to 450 degrees. 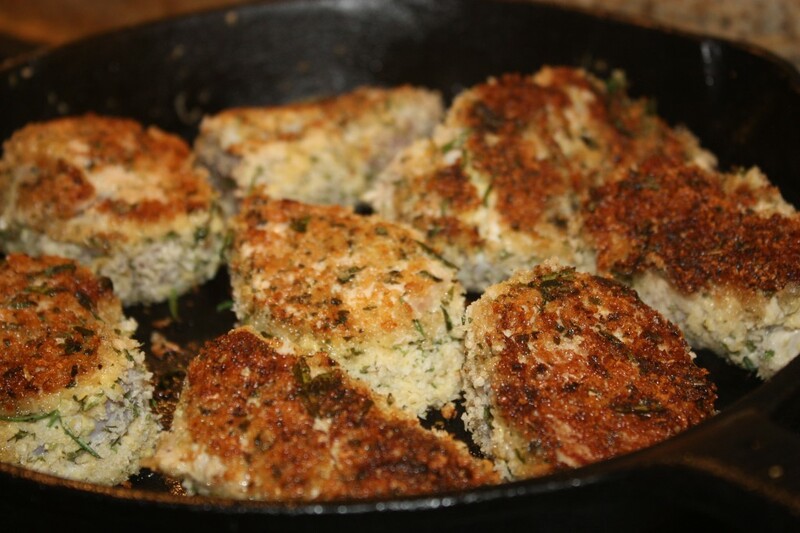 Rub mustard evenly over pork medallions, combine panko through pepper in a large bowl. Dredge mustard coated pork in panko mixture. Heat oil in a large ovenproof skillet (I used cast iron) over medium-high heat. Add pork and sauté 2 minutes on each side or until golden brown. Place skillet in oven and bake for 8 minutes or until pork reaches 145 degrees. Saute shallots, jalapeño and garlic in melted butter for 1-2 minutes. Add diced peaches. Cook for 2-3 minutes, add sugar, brandy and vinegar. Cook on low heat until peaches are soft. Season with salt and pepper. Plate two medallions, add chutney, and drizzle balsamic glaze on top. Take a close look at the recipe. It’s very easy to make, and my family loved it! Grilled Shrimp Bruschetta with Mandarano Balsamic – toasted bread topped with fresh tomatoes, basil, garlic, mozzarella cheese, grilled shrimp, and a drizzle of Mandarano’s Balsamic Glaze!